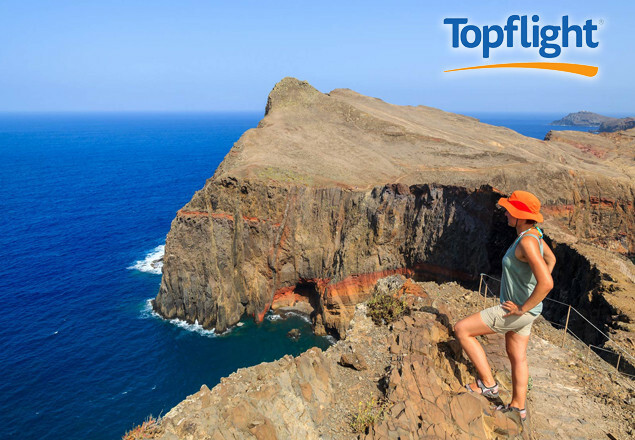 We have teamed up with Topflight to offer you a chance to avail of an exclusive 7 night trip to Madeira, including flights, transfers and accomodation. This offer is available for travel on a choice of dates - choose from 20th July or 24th August. Enjoy a comfortable stay in the four star Jardins d’Ajuda Suite Hotel, a stylish hotel with excellent facilities. Jardins d’Ajuda Suite Hotel enjoys a stunning setting amidst beautifully maintained gardens. It is conveniently located just a couple of miles from the heart of Funchal. This elegant hotel offers comfortable accommodation and excellent amenities. You will be spoiled for choice by the abundance of facilities on offer at the Jardins d’Ajuda Suite Hotel. The hotel features two outdoor swimming pools, as well as a lovely indoor pool - all of which are perfect for relaxation. Turkish baths, a sauna, hydro-massage and a gym are also available for guests. A delicious breakfast buffet is served in the mornings, along with an a la carte menu for lunch and dinner. A coffee shop and a cocktail bar are located beside the swimming pools, where live music and entertainment occurs regularly. All bedrooms in the Jardins d’Ajuda Suite Hotel are equipped with a TV, a hairdryer, a safety deposit box, a direct-dial telephone, double-glazed windows, air conditioning and a balcony. Rooms with a kitchenette are available. Guests can enjoy stunning sea or mountain views from their bedrooms. Jardins d’Ajuda Suite Hotel is in a good location close to the sea. It offers easy access to the beach, a large shopping centre, and several restaurants and bars. It is 3km from the centre of Funchal, and offers a free shuttle bus service to take you there. The island's capital has much to offer, with great art and architecture, exquisite handicrafts, a colourful market and pretty marina. Here are some of the sights worth seeing during your time in fabulous Funchal! This is one of the most beautiful gardens on the island, designed with an oriental theme with an abundance of indigenous greenery, large ponds of Koi Carp and beautiful tiles and porcelain on display. Open daily 09.00-17.00. This is the most impressive of all religious edifices in Madeira. In the interior, a ceiling in geometric Hispano-Arabic style of carved cedar inlaid with ivory, is outstanding, and the canonical stalls in the chancel are of exquisitely carved wood. Open Monday to Friday from 09.00 to 11.00, and 16.00-17.30. Situated next to the Palheiro Golf course, these gardens offer you lovely views of Funchal, surrounded by subtropical flora. Open daily 09.30-16.30. The 15-minute trip by cable car from Funchal to Monte offers magnificent, truly breathtaking views. Approximately 9 euro one way or 15 euro return per person. Why not combine a cable car trip up to Monte with a return journey via the Monte Toboggan, a wicker carriage controlled by two conductors in traditional dress? An unforgettable experience, from 20 euro per person. Purchaser of this offer should call immediately to book with Topflight on 01 2401700 or email:info@topflight.ie as seats are limited, with your name and voucher code.